Note: If the Shapes eBook navigation link brings you here, click to take you to correct page. Download Info: If you are paying through your PayPal account, please be sure that the email address that PayPal has is the one you want to use. In some cases these emails are out of date and you will not receive the link. Please check the bottom of your browser screen when you activate the link as you may have to respond to these browser prompts. In Explorer this is the message that may pop-up. Other Browsers may have something a little different. If you are not sure where to find the file, with Windows Vista and Windows 7, you can search for your download in the search window. Click the Start button, and type the name into the search box. You can also check your Download folder. 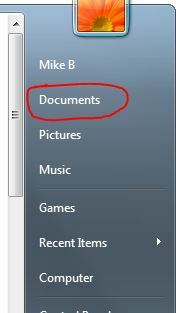 Click on Documents from your Start menu and then on the Downloads folder.